Once a year I get together with three of my cousins and a couple of friends and scale a mountain, preferably one with a glacier where we also have to climb a bit. This year’s choice was the Marmolada, the queen of the Dolomiti mountains in Northern Italy (http://en.wikipedia.org/wiki/Marmolada). We chose the highest of the five summits on the ridge, the Punta Penia. We drove to our starting point near the town of Canazei. The area is called South Tyrol, it was the site of heavy mountain combat in World War I (http://www.worldwar1.com/itafront/marmolada.htm). After hiking for an hour and a half we reached our beautiful hut for the night, the Rifugio Contrin (http://www.rifugiocontrin.it). 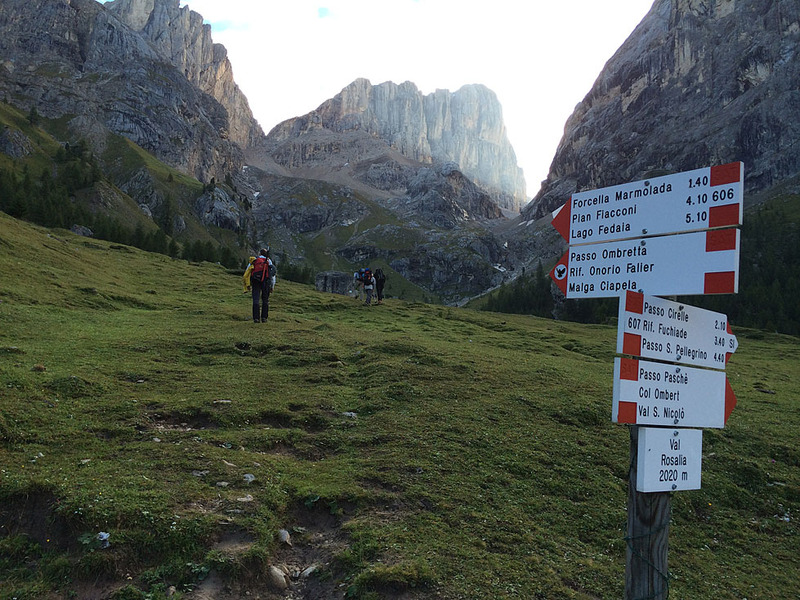 After a good night’s sleep we started our tour and reached the “Forcella Marmolada” in a couple of hours. That was where the real fun began. A “via ferrata” (http://en.wikipedia.org/wiki/Via_ferrata) is an “iron path” that leads up the steep rock face. We all brought a via ferrata kit which served to attach the climber to the metal cable. Every few yards one has to disconnect the carabiners one at a time to continue to the next rock joint. This enabled us to scale the steep rock face that would otherwise have been impossible to climb. Below you can see the entire course starting at the bottom right. Two hours later we reached the end of the via ferrata and the beginning of the glacier. Here we took out our crampons, attached three people to one climbing rope for protection against falling into a crevasse, and marched to the peak. We then descended along the glacier, on the diagram above on the bottom left. An antique single person lift then took us to the bottom of the valley. It was a fantastic two day tour!